ProCare Abdominal Binder from HealthyKin.com provides abdominal and lumbar support with four sewn-in plastic stays. 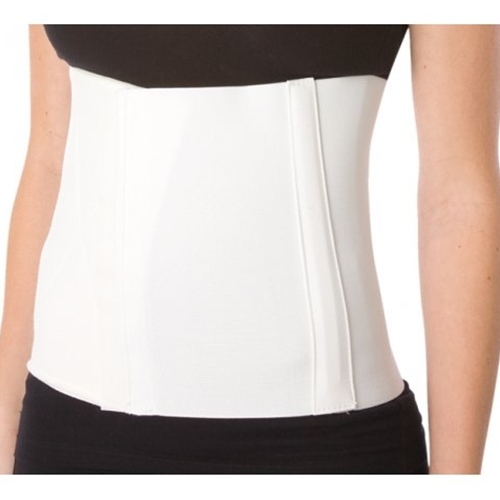 It is ideal for providing compression and support for strains and weakness of the abdominal area. This works very well. I'm pretty short, so the 10" width is perfect for me. The plastic stays keep the binder from rolling down, which I really appreciate. The only negative is that the fuzzy side of the velcro closure doesn't last very long, but should be fine for a couple of months. the elastic is week-stretches too easy. I have a large diastasis recti and I need to have it be tight. It is better than an older version a PT gave me.